The world famous rock band Kiss will give a concert in Madrid in 2015. 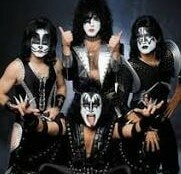 Kiss is an American hard rock band which was formed in 1973. During the years the band went through some major line up changes and it currently consists Paul Stanley, Gene Simmons, Eric Singer and Tommy Thayer. The Kiss is well known for their special appearance including their stage outfits, the face paint and the group extreme performances which includes fire breathing, blood spitting, shooting rockets, pyrotechnics and smoking guitars as well. In a short period of time the band got extremely popular and famous all around the world and it is still one of the most known and outstanding hard rock bands in the world of music. The Kiss sold over 100 million records world wide through the years which made them one of the world’s best selling musicians. From 2014 Kiss is on a world tour with The KISS 40th Anniversary World Tour. With the tour the band will give 83 shows world wide. In this occasion the band will perform in Madrid as well as in Barcelona, Hamburg, Berlin, Vienna, Prague, Paris and Amsterdam. The concert in Madrid will be held on Monday 22nd June 2015. The concert will take place at the Barclaycard Center – Palacio De Deportes Comunidad. Tickets for the concert are already available. For more information on the tickets and prices visit WorldTicketShop.